#4483 was built in May of 1923 by the Baldwin Locomotive Works in Eddystone, Pennsylvania for the Pennsylvania RR, #259 of a lot of 475, c/n 56534. This "Decapod" is the last one in existance of the "I-1s" class, of which 598 were built. In February, 1931, it was converted to an "I1sa" (109 were built class I-1s and later converted) and assigned to the Eastern Region, Susquehanna Division and Northern Region. On 11-1-1944, #4483 was reassigned to the Eastern Region, Central PA Division and Williamsport Division when it was equiped with "Cab Signal, Whistle and Acknowledger." The I1sa class was designed for freight service, and all came with piston valves, 62-inch drivers, and a boiler pressure of 250 p.s.i. as standard equipment. 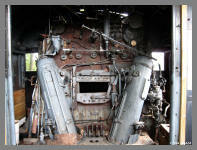 With a huge firebox (312 square feet), twin automatic stokers were installed to keep the large 30.5" x 32" cylinders full of steam. The stokers and power reverse gear were unusual luxuries that the Pennsy rarely applied to freight locomotives, The twin air tanks on the pilot gave the class a distinctive and powerful look and the name "Hippo" became an affectionate reference. #4483 was no stranger to Western New York, having been assigned to the PRR Ebeenezer, New York yards in the early 50's, and was often seen hauling coal drags up the Elmria Branch to the coal unloading docks in Sodus Bay on Lake Ontario, New York. 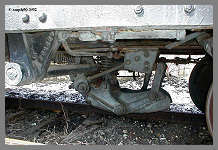 The locomotive was dropped from equipment records on August 7th, 1957 by PRR Chief of Motive Power, Hal T. Cover with instructions to "Hold as Relic." 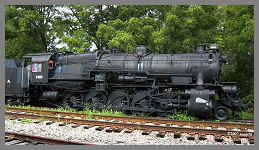 When the Pennsylvania dieselized, the I1sa's were retired and #4483, one of the last to operate, was preserved and stored with other PRR steam power at the Northumberland, Pennsylvania, roundhouse in 1959 as the last remaining example of the class. 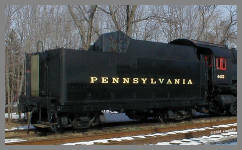 In 1963 the Pennsy sold the engine to the Westinghouse Air Brake Company (WABCO) to display on the front lawn of their headquarters in Wilmerding, Pennsylvania, with the PRR business car the "Ohio." WABCO executives had long wanted a railroad display, since their main product (air brake components) was railroad related. Unfortunately, the equipment was neglected and it soon deteriorated. Sometime during the mid-60's, Westinghouse removed the asbestos boiler insulation but, other than sandblasting and paint, the locomotive received little attention during its stay in Wilmerding. In the fall of 1982, WABCO offered the locomotive to any non-profit organization that could remove it from the property before year's end. 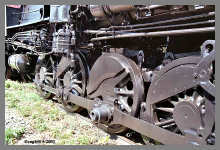 Representatives from the Altoona Railroaders Memorial Museum and the WNYRHS inspected the engine in November but the RMM turned the offer down. On November 22nd, 1982, the WNYRHS took official ownership of #4483 and the PRR Business Car the "Ohio." 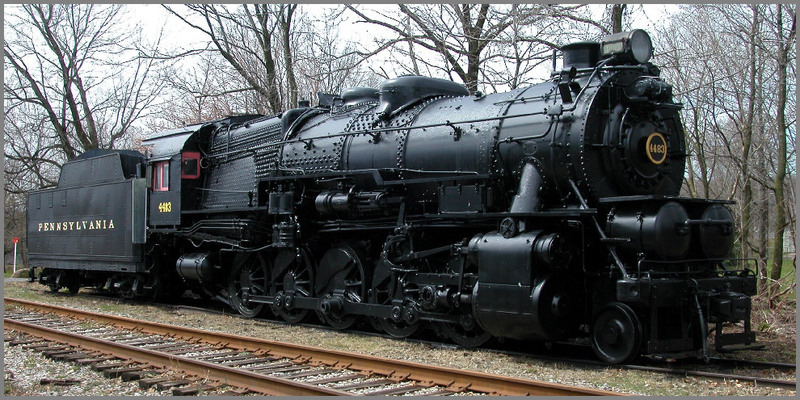 Click here to read "#4483's Journey to Buffalo Diary"
Today, the locomotive is on display and is currently undergoing cosmetic restoration at the Societies work site in Hamburg, New York with its short haul tender. 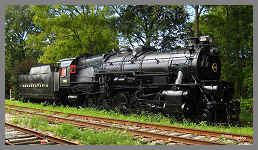 Cylinders (dia x stroke) 30.5" x 32"
Click here to read how four Decapods battled the"SHAMOKIN VALLEY BRANCH"
The Western New York Railway Historical Society is privileged to own this locomotive and we are well aware of its historical significance. Given the current location of the engine, we have invested hundreds of hours over the years to ensure that the effects of weather do not affect its structural integrity. Oiling, painting and replacing consumable sheet metal, have always been part of our conservation efforts of #4483 over the years. We are often asked "are you going to get it running?" As cited by many other high profile locomotive restorations the cost of a "Class 1" rebuild is now in excess of $2 million dollars. But more important is the question of "where will you operate a such a large engine." Class 1 railroads are very, very reluctant to allow a steam engine on their rails without a long proven track record of reliability and huge liability insurance coverage. Since the WNYRHS Inc. does not own any track, investing large sums of money for a semi-static display piece would be fiscally irresponsible. We are working with Norfolk Southern to get active rail access to the Heritage Discovery Center in downtown Buffalo, NY where #4483 will be moved and eventually placed under protective cover. Until then, we will continue our preservation efforts to ensure that this locomotive will be available to many generations to come and enjoy our wonderful industrial heritage. Web Design & Hosting by - Scott H.